Don't Miss Out On The Discounts!! Optional Winners: This includes most beautiful/ handsome, portfolio, photogenic, Eyes, Hair, smile, and best dressed for each age category will receive a banner and gift. Entries received by July 15, 2009 receive all items for $125 which is a $55 discount. Entries Received by August 1, 2009 receive all items for $150 which is a $30 discount. Entries must be received by August 15, 2009 to receive all items for $180. So Much More Than Winning Headshots!! So Much More than Winning Headshots! CLICK ON THE BANNER FOR MORE INFO!! Donna Mallard Photography Delivers on Time! & had all 3 retouched enlargements in less than 24 hours!! Donna Mallard Delivers on Time!! ONLY TIME IN 2009 DONNA & MADONNA WILL BE SHOOTING AT THE BEACH!! Heather Has Her Donna's .... It's Your Turn! LOW, LOW, ENTRIES - We Have More Crowns Than Contestants - DON'T MISS THIS AWSOME CHANCE! DO BEAUTY FOR ONLY $125 - ENTER NOW! Win a $300 Room Credit for Nationals! LAST PC BEFORE THE EARLY BIRD DISCOUNT!! 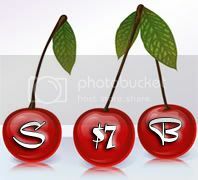 4 Level Winners in Natural AND 4 Level Winners in Glitz win their $595 pkg paid! have the opportunity to get a $100 room credit!! Not 1, Not 2, but 3 CARS to be Won!! Who Says Babies Can't Win Cars? Cambree Knows.......at Dixieland You Sure Can!!! Be sure you are on our mailing lists! 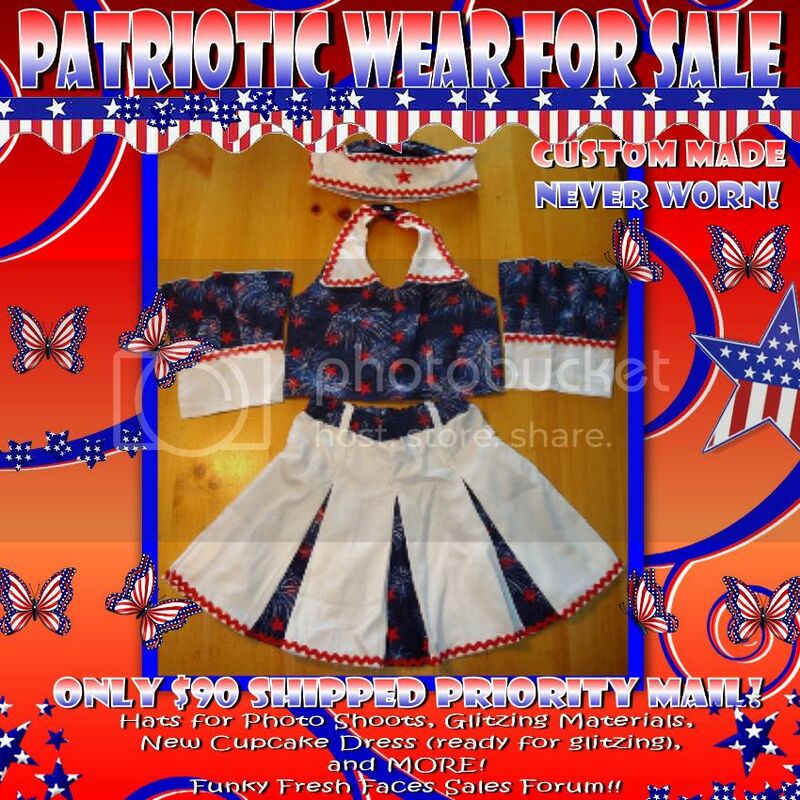 Custom Made Patriotic Wear! Never Worn! Minis will receive 1 free entry for next PC. Will You be OUR FUNKY FRESH FACE?? 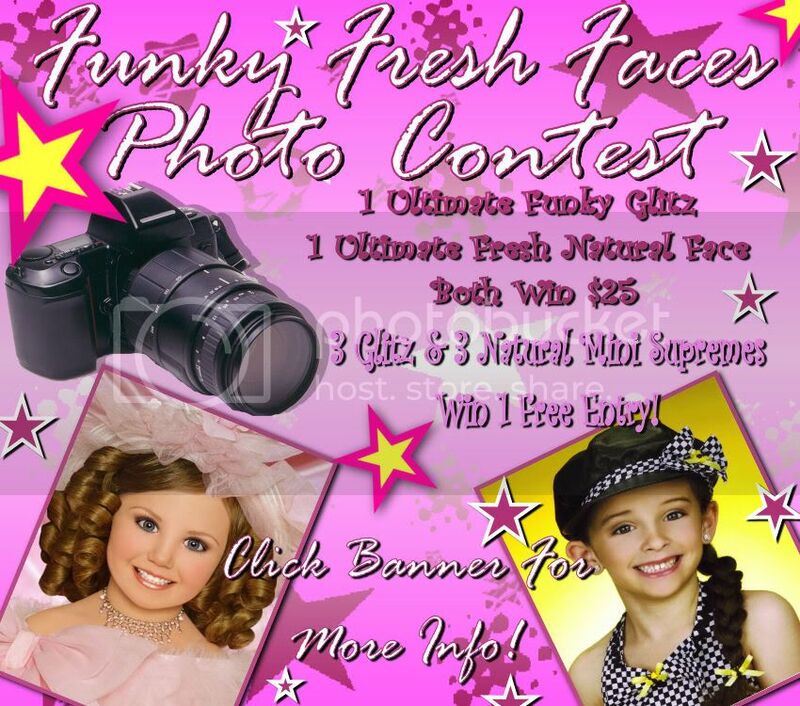 > "Funky Fresh Faces PC!" >Minis will receive 1 free entry for next PC. >Will You be OUR FUNKY FRESH FACE?? Click banner for� more info! Schedule..July 23rd....Early day.... 24th Registration, Competitions & Party, 25th Competition and Official Crowning in the evening, 25th Beauty Crowning, Pageant over before noon.. Winners will receive a Beautiful custom round crown, Monogrammed custom sash, Trophy, Scepter, flowers, crowned in velvet robe, gifts, many travel opportunities, and much more...........scholarships will be according to numbers in pageant. More than anything you will gain friendships that will last a lifetime. If you are planning on attending UMMI or America�s National Miss you need to book your hotel reservations ASAP. The Hotel is almost SOLD OUT!! All you need to Win is Beauty, 1 stage event and 1 photo event!!! All CASH and Prizes Guaranteed on Stage! All you need to win Supreme Package Only $495! Miss & Mr Elegance pageant since we haven't done one in ages. Earlybird 1 � May 15th!!! Crown, Sash, Trophy, Gifts, Prizes and Cash! Just 2 Optionals to Qualify for Grands! Only a few days left to enter!! Many divisions with low entries! Entries needed in the 0-4 year divisions! Entries are Low, Low, Low! It's not to late to enter! Make plans now to join us April 24th -26th in Gatlinburg, TN! We have added Talent this year! Click on the banner for your National Paperwork! 2009 Grand Nationals July 2-5, 2009 Las Vegas, NV! 1 Supreme Winner receives Supreme Entry FREE ($495 value) to the 2009 International Grand Finals Fees! 1 Winner per age division receives $150 CASH off 2009 International fees! Winners will be notified no later than May 20, 2009! DON�T MISS YOUR OPPORTUNITY TO WIN FEES OFF TO BOTH NATIONALS AND RECEIVE SOME AWESOME GIFTS TOO..
SPACE IS LIMITED AND FILLING UP FAST SO DON�T WAIT SEND YOUR APPLICATION TODAY. Need Help raising money to attend our nationals? Check out our super sponsor page! Hope YOU'LL Join Us For The FUN! of representing your wonderful Pageant! Do you have your OPP - 3D Holographic? You get yours FREE at Porcelain Dolls, email us for details! Gets all their After Stage Portfolio Shots, shot for FREE! We now have a minimum of 3 Supreme Titles per age division. 61 National Supreme Titles in all. Due to a number of requests we are extending the early bird. 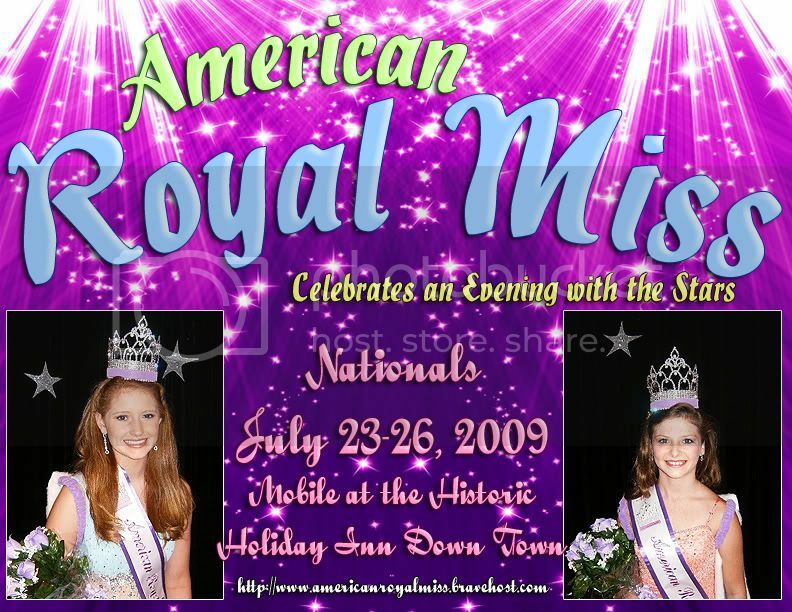 ENTER by February 28, 2009 receive Beauty, all events and registration fee for only $550 you will also receive entry into ARG Amethyst Supreme. DON�T MISS THIS EVENT. We added LEVELS but awards stay the stay. Awards include portable dvd players, MP3 players, IPOD, DVD players, stereo, television, diamond, emerald, sapphire, ruby jewelry, digital camera, coach bags, tons of dolls, toys, games, stuffies, webkinz, mushabelly and so much more in addition to all our savings bonds. Everyone receives a special personalized gift. At ARG we feel you are all winners. Everyone is recognized on stage during our award ceremony. Everyone receives a gift. NO ONE goes home empty handed. CHECK OUT THE PAGEANT SYSTEM THAT HAS EVERYONE TALKING! NO ONE EVER LEAVES WITH OUT A CROWN, SASH AND BAG OF GIFTS! GRAND SUPREME, MINI SUPREME AND QUEEN IN EVERY AGE GROUP! !